Location: Templepatrick, County Antrim, Northern Ireland. Ownership / Access: Danny Kinahan MP and his wife . 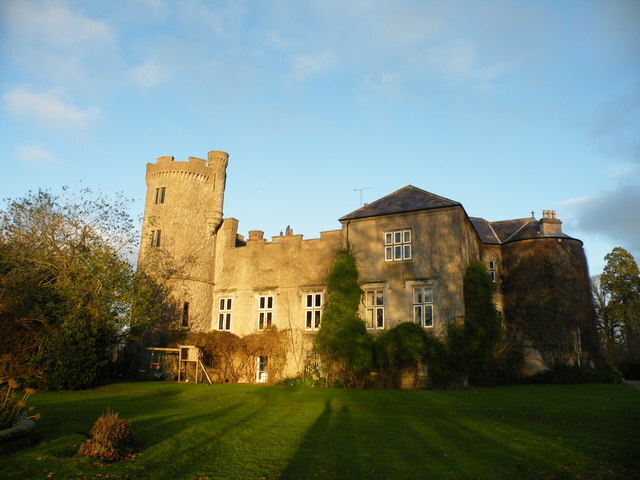 Notes: Castle Upton is a castle situated in the village of Templepatrick, County Antrim, Northern Ireland. One side of the main street in the village of Templepatrick consists of the 18th Century demesne wall of Castle Upton. An impressive fortified gateway in the wall at the centre of the village leads up to the castle. The core of the main house is a tower house, originally thought to be part of a Commanderie of the Knights of Saint John (Hospitallers) with walls up to five feet thick, and the main bulk of the building was created in 1611 by Sir Robert Norton and originally known as Castle Norton. It was purchased in 1625 by Captain Henry Upton, who became Member of Parliament for Carrickfergus in 1634 and renamed the building. The stable block was built from exact architectural copies of the now demolished old Fish Market of Leith, near Edinburgh, Scotland. The Templeton and Upton family mausoleum is in the care of the National Trust and is open to visitors. Many Templetown viscounts and barons are buried there. The mausoleum was built in the form of a triumphal arch by Robert Adam, who also extended the house in 1783. The house is currently inhabited by the Kinahan family, being purchased by Sir Robin Kinahan in the 1960s, and extensively restored by Lady Coralie Kinahan. The surrounding graveyard contains the graves of such notables as William Orr (United Irishmens' Rebellion), and Josias Walsh, grandson of John Knox, the Scottish Reformer. One of the notable achievements of this castle is the reconstruction of the wrecked Adam wing. This wing, now contains a ballroom in which an Italian, marble chimney has been added. The owners of this castle obtained this chimney from the Downhill Castle in the County Londonderry.